Catholic Shop specializes in religious jewelry. In fact, we've been the leading online source for more than a decade. Choose from thousands of Catholic medals and religious pendants. Our trained Catholic jewelry experts source only high-quality religious products befitting of our faith. Plus, every item comes in a deluxe jewelry box and includes free shipping insurance. 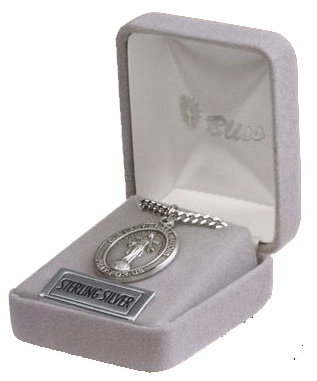 We also offer personalized engraving on many items, like our patron saint medals. Customers also love our gold and silver Miraculous Medals, St. Christopher medals, crucifix pendants and more. ► Need help? Simply contact us or use our handy jewelry guide. 3/4" Dark Blue Capodimonte Cameo made in Italy Miraculous Medal with Gold over Sterling Rope Frame. A 18" Rhodium Plated Curb Chain is included with a Deluxe Velour Gift Box.